Earned for being the first completed game. What a hilarious way to see that case. This game will be pretty awesome, coming from you. The autobiography of a whale who wants to learn how to sing. getting collision working properly is proving very awkward. Making the environment more interesting. Hoping I'll have the main game sketched out and playable in full by tonight. Any feedback on the art/colour scheme welcome. That already looks awesome, but a question: will everything 'wiggle' like the static on a TV? Because that would be even more beautiful. 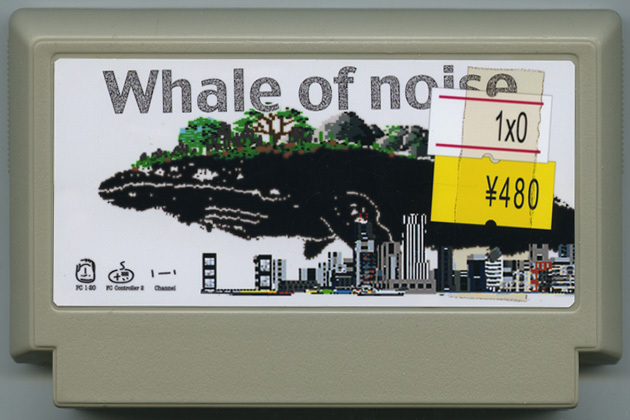 The whale is rather hard to read against that background, but I like the idea behind it. The whale is quite flickery when seen in-game, so there's no real danger of that. (The issue being more that it makes everything else look a little boring and unanimated by comparison if anything). I tried something like that out, and found it really distracting (for the whole screen to be alternating between two variations). That looks so cool. I really like those colors. Any feedback on the art/colour scheme welcome. I like it, but I'm not sure I can read it. The orange/brown/green bits are presumably rocks/landmass, but it's not clear if the upper section is sky or ocean (it's a very sky blue, but the boundary seems a little too indistinct to fit. Pretty cool stuff, love the visuals! Really enjoyed it, especially the sounds of the whale. Very interesting gameplay too. What browser/os are you running? Whoa. That was really nice. Maybe add "the end" or something like that? Because I waited on that white screen for a bit.